There are 49 pillows in our three-bedroom apartment, not including couch or seat cushions and travel neck rolls. That averages to over 16 per person living here. I sleep with two, one of which usually ends up on the floor. All of my daughter’s are on the floor. Four are stored in the closet for potential guests who may also require a lot of pillows, so we are apparently only using 45 on a daily basis. 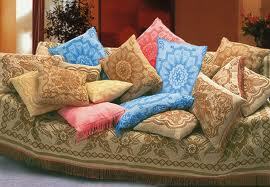 One of our couches is used for the sole purpose of displaying pillows. When we have company the pillow police require that all pillows must be fluffed and remain so until the company leaves. So we can only sit on hard chairs and can’t nap. Needless to say, I didn’t buy any of these pillows. How many pillows do you have? This entry was posted in Humor, Ruminations and tagged Humor, Musings, Relationships. Bookmark the permalink. Counting the pillows? What would your fraternity brothers think of Fast Eddie now? Great blog, Ed! I look forward to reading more! As for the pillows, I have far fewer than 45! 49 pillows and not one is the right firmness for sleeping comfortably.